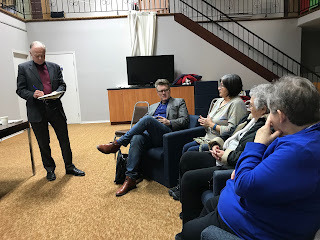 February 26, I was in The Pas with Manitoba Liberal Leader Dougald Lamont as part of our public consultations on the status of Health Care in Manitoba. There is a major concern over Health Care in Manitoba at the moment, in part because the Pallister PCs have been making major changes and these are causing concern, uncertainty and low morale within the health care system. In each of our public meetings as part of our effort to see where health care is at, we asked three questions. 1) What is working well? This question is important because the starting place for improving our health care system is understanding what is working well. Items that fall in this category need to be supported and indeed built upon and used as models of good care to improve the system. 2) What is not working? This is an important question because it identifies where there are problems which need to be understood and addressed to improve the system. 3) Where do we need to invest? This is a critical question because it identifies areas which will need additional funding in order to correct the deficiency. - When the Nun's were running the hospital a number of years ago, it was well cared for, the health of people was well looked after, the inside of the hospital was kept spotlessly clean and the doctors showed up when they were needed. - The Bachelor of Nursing program in The Pas at UCN has been very good and very helpful in ensuring there are quality nurses working in the community. - A resident in The Pas who was sent to Winnipeg for an appointment only to arrive in Winnipeg to find the doctor was on vacation wasted 18 hours spent travelling, $3000 in transportation costs and was completely unnecessary as the problem could easily have been handled over telehealth. - Long waits - up to 7 hours - to see a doctor in The Pas Emergency Room for emergencies. - Long delays in reimbursement for medical expenses when there is dual coverage by Manitoba Health and by an employee health plan. - In ensuring major improvements to the telehealth system in The Pas and its use by The Pas physicians and in the access to specialists in Winnipeg when needed, including for emergencies during the night. - In audits of doctors by the College of Physicians and Surgeons or by the Faculty of Medicine (clarity is needed as to which body is responsible) where concerns are raised about the quality of care being provided.